Robotic assisted surgery has been a reality for the last three decades. It’s happening more and more thanks to advanced medical and robotics technology. Doctors and surgeons are able to dexterously operate on various parts of the human body with precision control and care—without having to even directly touch patient. That’s because robotic capabilities have proven to be an asset when it comes to speedier and safer operations, even in the cases of complex microsurgery on the brain, heart, and other parts of the body. Now, there’s a new robot that could change the way doctors perform a notably risky but important procedure for hearing impaired patients. 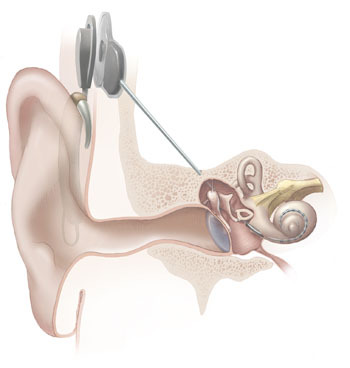 Cochlear implant placement requires microsurgery in which the skull must be drilled and an implant carefully positioned in the middle ear. Surgeons must deftly maneuver through the skull, around facial tissue and nerves to complete the procedure successfully, but even the slightest human error could result in a flawed outcome. The tiniest movement or tremor in the drilling process could cause patients to lose hearing capabilities they may have had prior to the placement of implant. Fortunately, a robot has been developed to assist in the procedure and mitigate errors, which would significantly reduce the risk of common complications. The cochlear implant drilling robot was developed at the University of Bern in Switzerland. It has been specifically designed to drill into the skull with greater precision and less potential for error, allowing for a smoother, safer cochlear implant operation. The robot was first used in a clinical trial in 2016 to assist in cochlear implant surgery in a 51-year-old patient. In addition to performing the drilling, researchers are looking at ways this robot could potentially place the implant as well. To date, the robot has helped complete four of these trial procedures. The University of Bern team is also using the robot to show how it can be employed in surgery planning systems, stereo vision, live detection of tissue types, and other capabilities that would be essential in robot-assisted microsurgery. It may not be long before robots like this are considered to be imperative medical tools for all different types of procedures, including some of the most complex. Have thoughts to share on this story?